If someone had to ask me – what would be my “desert island” cake, I wouldn’t hesitate for a minute. It’s this simple beauty. Although chocolate figures largely into the equation for many of my favorite desserts, as much as I love Chocolate Orbit Cake, I’d have to pick this Almond Cake as the one that I would choose to sustain me through thick and thin. We made almond cake at least once a week when I baked at Chez Panisse, and I’ve adapted the recipe from one of my baking bibles, Chez Panisse Desserts by Lindsey Shere. Lindsey was the executive pastry chef of the restaurant, and co-owner since the very beginning. When she started baking desserts for the restaurant, she baked in a home oven stowed away in a shed behind the restaurant. That just goes to show that you don’t need a lot of fancy equipment to bake something wonderful. If you have just a few ingredients, and a standard cake pan, you can bake this exceptionally moist almond cake. This cake is endlessly adaptable, and once I baked it in loaf pans, split the cooled cakes horizontally four times, smeared a bit of dark chocolate icing between each layer, then stacked them back up. I frosted the whole thing in more chocolate icing and when I gave a slice to Lindsey, she asked me where I got such a delicious recipe. Ha! Although chocolate is wonderful with this buttery almond cake, this cake shines equally bright when paired with lightly sweetened fresh peaches, plums, oranges, apricots, or whatever berries are the most spectacular at the time. I’ve also served it successfully with quick-candied cherries or poached pears with chocolate sauce. And for those who like tea-time cakes, it can be split horizontally and filled with a thin layer of raspberry or apricot jam, reassembled, and brushed on top with bit more jam and a layer of toasted almonds, then finished with a dusting of powdered sugar. To get the paste fine enough, enlist your food processor. It makes quick work of the job and breaks up the almond paste very well. If you don’t have a food processor, be sure the really get the almond paste broken up as fine as possible in your stand mixer. Adapted from Chez Panisse Desserts by Lindsey Remolif ShereAs mentioned, this cake is best made in the food processor. 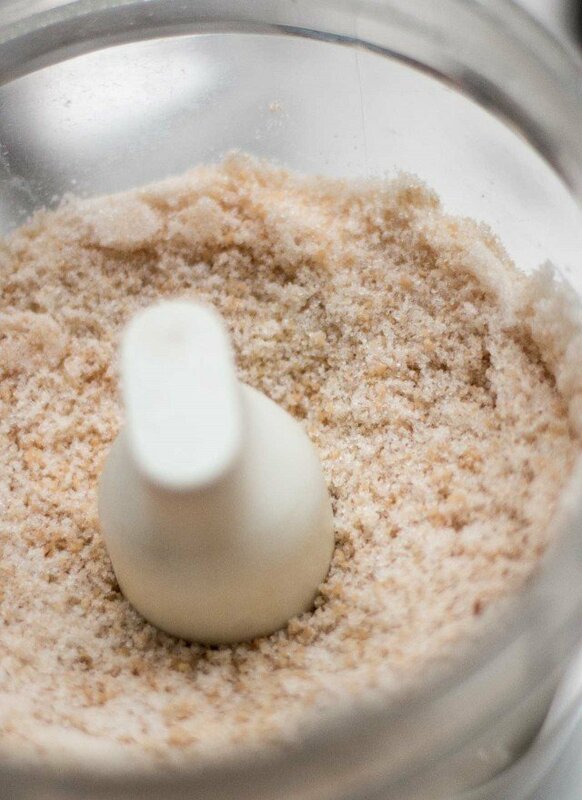 If using a stand mixture, use the paddle attachment and let the mixer run until the almond paste is finely broken up. There’s a few notes at the end of the recipe, including some almond paste tips and suggestions. Notes: For this cake, I used this 9-inch cake pan, whose sides are 2-inches (5cm) high. Some readers noted that the batter rose higher than their pan, although I’ve made this cake well over a hundred times and have not had that problem. So use a standard size cake pan whose sides are at least that high, not a layer cake pan, which is shallower. In the United States, Solo and Odense are good brands of almond paste available in supermarkets. I’m partial to the almond paste from American Almond Products, which is marketed in home baker-sized containers under the name Love ‘N Bake. Here in Japan, I don’t have a food processor. Hell, I don’t even have an oven. I bake things in my crock pot. I have the old school Rival model that came with a bake and serve pan. I get raves. I will have to use my suribachi to mix up the almond paste. It’s a Japanese mortar and pestle. I will search for the almond paste in the food basements of the department stores in Tokyo. You should come to Tokyo. This city is foodie central. All the French bakeries have outlets here. They even have a shop that sells French butter. Hi David, maybe you don’t know, because you’re not in the states at the moment, but does anyone know what widely-available brand of almond extract uses the pure extract from bitter almonds that is recommended here? I’ve found the brands that are easily available at the grocery store to be too sweet. I’ve got the wonderful smell of almonds in mind (in nose??) now after reading this! Ahhhh, what a wonderful smell. I like the idea of almond paste in an almond cake recipe. I bet it makes the cake so moist. For those needing to be gluten-free, I have seen almond cake recipes that use about 200g of almond meal/flour, and six eggs or so. 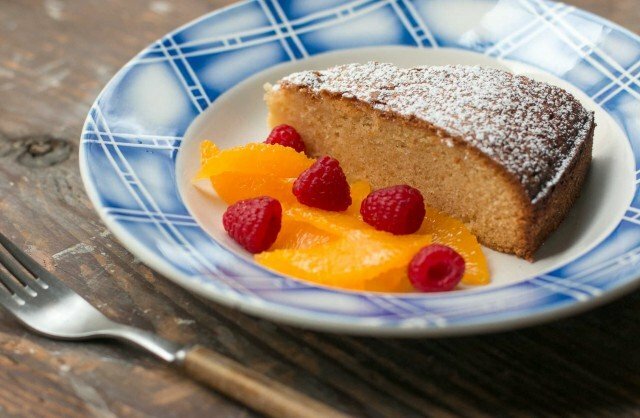 A blogger friend of mine, Les rêves d’une boulangère posted an orange and almond flour version here just the other day: Orange and Almond Cake. It uses no flour. I bet a good gluten-free flour blend for your version would be great, too. Ahhhhh, aaahhhhhlmonds. Thanks, as always, David. thanks for the interesting recipe. I don’t know about getting this almond paste in Switzerland, though… What we have here is almond “püree”, which is 100% almonds, and almost liquid. That wouldn’t be the right thing, would it? When you say almond paste is 33 or 50 % almonds, what’s the rest? Sugar? Then maybe I would have to use marzipan, which I can get in blocks here. Yum! Everything is better with almonds. Even almond butter is better than the peanut version. Oh, I’d forgotten about this cake. Looks like my sweet almond binge will continue… Have to have something to go along with all the fruit right now, no? Stefan: The ‘paste’ you’re referring to is likely what we call in the states, Almond Butter, and is simply ground almonds. Almond paste has sweetener added. The ingredients in the one I find here in Paris include almonds, as well as sugar, glucose, and water, and (unfortunately) some stabilizers. I think the natural food stores sell almond paste here in small quantities, too. You can visit the websites of the almond paste producers which I linked to in America to find out more about their exact composition. Then you can use that as a basis of comparison to match a product from where you live. David: I love Tokyo and was there a few years back. Would be thrilled to return, and see more, as well as the rest of Japan. Well, I certainly am going to try this but just with finely ground almonds as found here in France. No doubt the paste form will give a moister texture but I avoid sugar/glucose where possible (and heaven knows what else is lurking in there). Perhaps with some honey to compensate. In any case, a perfect accompaniment for fine summer fruit! The ‘missing’ the ingredients in the French paste may well be ground white beans. In the Netherlands, you have ‘gevulde [filled] speculaas’ filled with a layer of marzipan. This would seem to be a cookie heaven for some, BUT, no almonds – just ground white beans with added flavourings: bleah. Thank you so much! This is exactly the kind of delicious, easy, gluten-free-adaptable, non-chocolate cake that I need in my life TONIGHT. I need to do some serious baking to combat the winter cold and the winter blues, and seeing as I just ate an entire block of Guanaja Grue, I don’t want anything like cocoa in said baking. I really like the versatility of this cake. The almond flavor will pair perfectly with so many others. Drenched in a lemon-sugar syrup would make it divine. Thanks for this! For those people who do not have a hand mixer or blender yet, I recommend the same that David has if I remember well, the Braun Minipimer multiquick artiste. I have it too, and I must say that the quality of grounding is astonishing. The purées are soft and airy, with perfect texture (almost a mousse), even from the hardest ingredients as sundried marinated tomatoes or nuts like almonds. Plus, this blender/hand mixer do *not* break in bad fumes after two or three months, as other brands did in my kitchen before, when opposed to slightly heavier duty than usual :D. the device is a bit expensive, but I think it’s a bargain considering you won’t have to change it during the next fifteen years or so :D.
I need a nice friendly American to be willing to forward an Amazon.com order (since they don’t ship food products outside of the US). But while I figure out the paste problem I’ll carry getting my almond fix from Rachel’s pasticcini di mandorle over on Rachel Eats. Hi David! The recipe sounds wonderful and I’m going to try making it without the food processor since I don’t own one. I can’t find Cuisinart here in Switzerland and I’m sure they are the best. I can find, and do have 41% almond paste. So, Stephanie, if you live near a city that has a Globus store, they sell it. 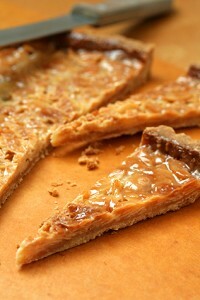 Mandelmasse or Pâte d´amandes. This cake sounds absolutely perfect. I would love to try it for this weekend. This sounds delicious — but your links may start bad habits for me! Who could resist a product called Love ‘N Bake? But then once I get to Amazon, they suggest Pistachio Paste and Hazelnut Paste as well!! I may have to try cake variations using them, too. I’ll let you know if it works out. As I sit reading this with my morning coffee, I’m thinking this cake along with a side of fresh strawberries (and of course whipped cream) would taste pretty good for breakfast right now!! This sounds like the perfect accompaniment to all of the fresh summer fruits! David, this looks amazing, will go great this weekend served with my abundance of raspberries taking over my back yard! Hi David – an off-topic comment, but I thought you would be interested, the beloved (at least by me) Fromagerie 31 on rue de Seine has closed. I refused to believe it until Cococook opened there last week. Maybe you have already heard this? I have asked around the neighborhood shops and no one seems to know where they have gone – if you have any inside information, I would love to hear it! I’m so sad I didn’t have a last 15-cheese plate there before they disappeared. Thanks for all the great recipes and Paris tips! I am a big fan. Almost finished with your ‘Sweet Life in Paris’ book. I love it so much that I don’t want it to end. I, too, love City Bakery and I curse those chocolate chip cookies!! French moment, on Page 204, it’s actually Grand Central Terminal – not Grand Central Station. In reference to your post today, you are welcome to stay with us at our place in Kenton-on-Sea, South Africa during December when we go for a month during the summer holidays (I’m American but have lived in Australia for the last 5 years). We have a beautiful view of the ocean where you can literally see whales standing on their heads to feed for minutes at a time and it’s about a 2 minute walk until your toes are in the sand. It’s in the Eastern Cape near Port Elizabeth and several small private game reserves. The only catch is you would have to bring Romain and make some carrot salad and anything chocolate while you are there. Think it over and keep up the entertaining and well-written posts! What a great recipe David, especially since it sounds like the perfect vehicle to deliver delicious summer fruits along with some dollops of whip cream. I have never mixed a cake in a food processsor. It really seems to be a very versatile cake with great flavor. It appears to be a little coarse in texture. Is it? I must try this. I like the one you posted with berries and cream but the chocolate layers sound very good, too. I second your choice. A good almond cake is truly a beautiful thing. Yours looks and sounds fabulous! This looks amazing! I need a dessert to make for a special lunch tomorrow, yours wins! Thanks! I bought a tube of almond paste a few months ago, but can’t recall why. Now I know I was just planning ahead for this. I can’t wait to try it with some just picked summer peaches. I can’t think of a higher recommendation than to hear that you would want this to be your lifelong partner on a deserted island. Is a Rocky Mountain view a suitable substitute for an ocean front balcony? That, I can offer. And I offer because I can’t say that I’ve seen almond paste here in Calgary. Then again, I’ve never looked. This looks wonderful! How does it compare to the traditional Tarta de Santiago which is a traditional treat in Spain? I walked the Camino de Santiogo about 4 years ago and loved eating this treat daily! The cake looks great. I still have some almond paste, so looks like I’ll be making this beauty tonight. My almond paste is from Tesco’s in London. It was so much cheaper than any almond paste that I’ve ever seen in the US and I live in California, the almond capital of the US. For GBP 1.75 for 500g, I stocked up (this was in April ’09), bought about 2kg of both the natural and the “regular” variety. Going to London again in September, hoping the exchange rate is still good, and getting some more. I love the dark crust on this cake. Generally, I run the risk of slightly underbaking any cake, assuming that a more-than-golden brown crust means dry death, but that almond cake’s crust makes it look hearty and strong, with a nice firm edge. I may make this cake just so I can get those dark edges and see if I like it. Also, the bibliography at the bottom is awesome. I’ve made the one on Amateur Gourmet and was less than pleased with the results, especially because almond paste is one of my favorite (and most expensive) baking ingredients. With that cake, the butter flavor was getting in the way of paste; texturally, perhaps the paste is really the only thick pasty solid you need for the recipe. I’m going to look around for a safflower oil/almond paste cake. The Sassy Radish link uses olive oil, but I’m not feeling the olive oil right now; it’s not late enough in the summer for me. Maybe I’ll try to adapt the basic yogurt cake recipe…. I’m so pleased to see from Anisa’s comment above that almond paste is available at Tesco! The only place I’ve ever found it is in Dean and Deluca last year, so I brought some back to London with me. I made a cake just like this from Jeanne Lemlin’s Simple Vegetarian Pleasures with it. It was absolutely delicious so I’m delighted to find a source so I can make it again. You had me at “Almond Cake”! The Big Beast Cuisinart comes out only when the poor little mini is about to explode from being overstuffed with ingredients. That looks wonderful. I haven’t had almond cake forever. I have to try this recipe. Haha, “Dessert Island”. Years ago I was station in the desert in Southern California and was trying to impress a girl with a note that mentioned that she was”the best thing about this God-forsaken dessert.” Lucky for me, she wasn’t much of a speller, either. Looking forward to trying out this recipe. I have a convection toaster oven in the garage that I use in the summertime whenever I get the urge to bake. This almond cake sounds AMAZING and looks moist and deliciously dense. A piece please! I have Chez Panisse Desserts and I LOVE it!! that is one amazing looking cake – i couldn’t imagine eating it any other way that just the way it is – no toppings, chocolate, or anything! and truth be told, i’m not usually an almond flavor gal, but for some reason i would make this in a second if i were home rather than “working”! I have made this cake many times and it is a favorite of my co-workers at Crate and Barrel here in Seattle. I have passed along the recipe to many of them. It is a very reliable recipe and can be tweaked in many different directions. Chocolate is my favorite, but fresh fruit, candied fruit and whipped cream are wonderful. I have even accented it with lavender once. Thank you for this David! This cake looks wonderful and simple and pure. And while I am printing this recipe right now to make this weekend, I’m not sure it’s my personal desert island cake. I’ve been sitting here for ten minutes contemplating the question. Big decision! I think I have to go with my grandmother’s apple cake. It’s simple yet rich, and works triple duty (important on a desert island) as it’s great for breakfast with some whipped cream cheese, or an afternoon snack with tea, or dessert with a drizzle of caramel sauce. I’m not sure if we get almond paste in the UK or not, will have a look round at the weekend. Have the brownies from your new book in the oven, smells good! I will have to try this one. My wife is constantly asking me to make stuff for her to bring into work. Maybe this will be the next. My desert island cake would be a 4 layer coconut cake I make that I moisten with Coconut rum, fill on 2 layers with a thickened pineapple crush and then ice with a lightly sweetened cream cheese frosting. I wish I could say the fruitcakes I make and sell for the holidays (10% to charity) but that coconut cake rules all. David, also wanted you to know you have inspired me to start a gourmet line of ice cream called Chubby Pug Ice Cream (named for my beloved dog, Sydney. I should be receiving my equipment this weekend. Hopefully soon I will be selling my ice cream and cakes at the local farmer’s market. Again, all proceeds will go to the Crohn’s and Colitis Foundation. That darn disease stole 9 + years of my life. Thankfully doing much better after my surgery. A note to Hannah above: I made a similar gluten free version of the above recipe a few weeks ago and drizzled an ounce or two of amaretto liquor on top…it was divine, moist, and lasted several days without becoming dry. Like Delia, I have a tube of almond paste in the pantry and cannot, for the life of me, remember why I bought it. Almond bread, maybe? Whatever. I know what it’s going in this weekend with some fresh cherries on the side. Yum. I absolutely love almond cake and its versatility. Just bought some Penzey’s Almond extract and some of their Mexican Vanilla extract, yesterday. Hmmm, and last week got some almond paste. I think this calls for a try! I posted an almond cake recipe just a couple of months ago during Passover. My first attempt at a delicious, elegant (served with Matzo Toffee Crunch, on the side, of course) Passover dessert, that was really good and didn’t remotely taste like cardboard. Though, it didn’t have the lovely crumb that your cake must surely have, given the gorgeous photo. If you are feeling the need for Passover in July (like some who start shopping for Christmas at about the same time…), you might like Passover Brown Butter Almond Cake . David, wouldn’t this be good as the cake for your upside down cake recipes? I’m gonna try it. This looks delicious! I have a question for you, and I know it does not belong to this post, but I’ll try luck: after piping the macarons, do you leave them in room temperaure until the following day when they are ready to eat, or do you put them in the fridge right away? For both alternatives, do you cover them with something or put them in air tight containers? Thank you! I make almond paste in the food processor. It is so incredible, I eat it straight with a spoon. In a food processor, combine 7 oz. each of sliced blanched almonds and powdered sugar and process until fairly fine. It may become so thick that you need to pulse the food processor. Add one egg white, a pinch of salt and one teaspoon of almond extract. Process until mostly smooth. Extra freezes well. Almond paste is a little pricey, so consider making it at least once to see how easy and good it is. This looks stunning. My grandmother makes something similar with hazelnuts which I adore as well. She makes it in bundt cake form and my favorite moment was when I got to snap a picture of it and post it on my site for the rest of the world to revel in. I will have to try the almond cake now too. As I picked three 6 pound baskets of strawberries today on a farm in Wisconsin, I think this recipe will be another vehicle for those luscious ripe berries. Much easier than making preserves (although I will make la confiture also). I’ve always used the recipe on the Solo can up to now–many thanks for this version. I’m waiting for one to arrive tomorrow. I’ve been making your almond cake for my husband’s birthday the past few years and I don’t expect that tradition to end anytime soon! Thanks for posting a favorite!! I like topping it with a glaze of powdered sugar, milk, and almond extract. As it drips down the sides of the cake and dries after a day or so, it gets a nice sugary crunch on the crust! Delicious!! We actually make this very cake at our Thai restaurant in Austin, Thai Fresh. I got the recipe from your blog a while back. It’s a big hit. Love it. The lovely little Fleur de Lis bakery near my house in NE Portland, Oregon made a very similar almond cake a couple of summers ago. Your recipe stirs up incredible sensory memories–it would also be MY desert island cake!, Reminds me that I must lean on them to start offering it again this summer! Or maybe just make it myself, using your well-tested recipe! Oooh what a great recipe. Mom and I both love almond flavored desserts-especially ones using almond paste or marzipan. Guess what cake will be baked for Mom’s next birthday? Thank you David! @ Kyle- I found a very reasonably priced almond extract that is pure and uses bitter almonds from Target under the brand Market Pantry. Check it out! A family favorite is this cake made with Love n Bake pistachio paste. So unbelievably good. Try it! I remember making Jacques Pépin’s almond cake before, nearly the same recipe as this and he also uses the food processor. I was actually thinking about making another version with pistachio paste instead =) and serve it with some lovely Griottines instead? since it is cherry season, after all ;) I’ll let you know how it goes! I love this cake recipe. My sister made it for her sons birthday one year and served it with fresh mixed berries and a simple vanilla bean ice cream — he has requested this cake every year since. Not your typical kids birthday cake, but he loves it! 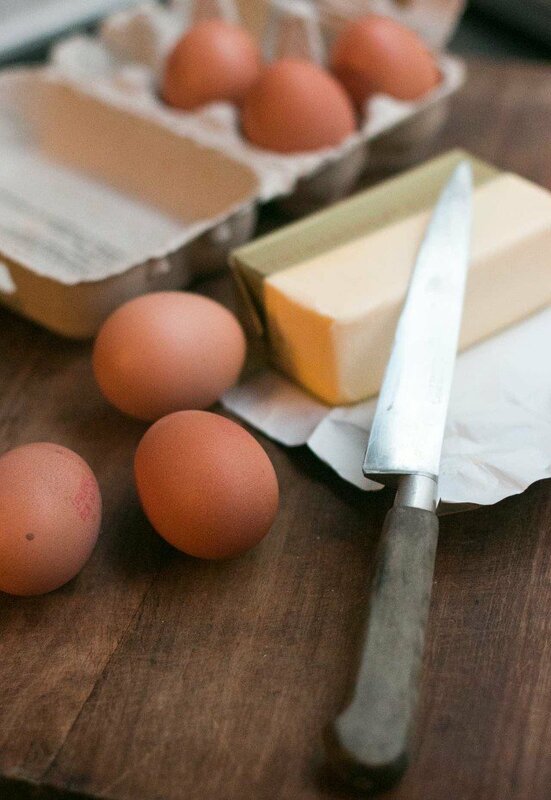 Great tip about thinning out the butter — I’m taking note to try it this way next time. Can I substitute almond powder for the almond paste? I have seen recipes for this cake using powder and wonder what the difference is. melinda: I’ve not used any of their other nut pastes, but I’m not surprised their pistachio paste is as good as their almond paste. But this cake does work very well with the brands I’ve found in supermarkets, too. Lillia: You could make some of my Quick Candied Cherries to serve alongside, too. Karin: Appreciate the gluten-free variation. Because of all the almond paste in this cake, I’d imagine it’s a good candidate for a gluten-free make over..
Linda H: Glad you liked it and the filling idea sounds great! Colonel: I agree with Shawna-and ice cream cake might be a lovely idea, too. 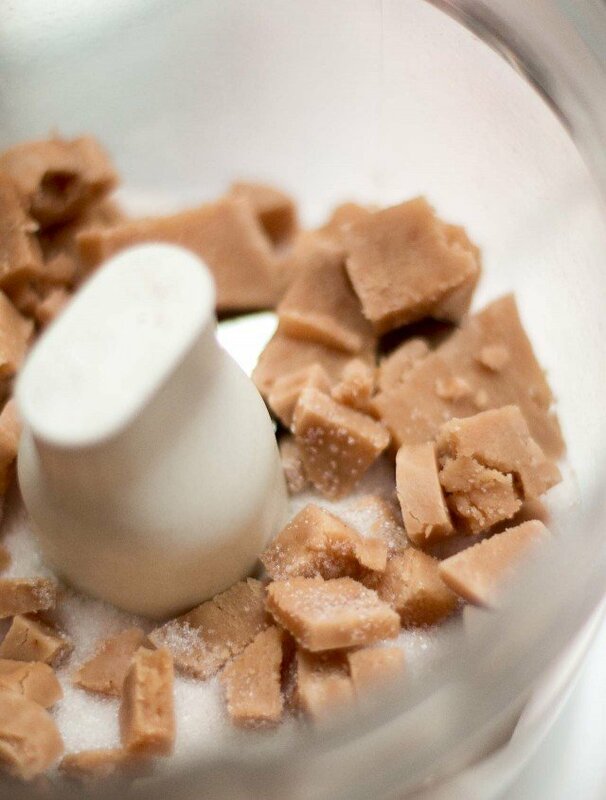 Cooking in Mexico: Thanks for passing along that recipe for homemade almond paste. I know some people in Europe make their own from powdered almonds, but those are easier to find here than elsewhere. I really love using almond meal for part of the flour in cakes. They sell it in bulk at Berkeley Bowl. 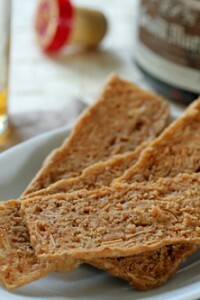 How about subbing some almond meal (flour) for some of the wheat flour in your recipe? I can imagine this would be delicious with the fresh blackberry sauce that I just made to go with homemade ice cream. The blackberries are just beautiful here right now, so I will have to make your recipe and try that combination. This cake is truly sublime. I made it last night for a birthday today and (as I do with all my cakes) made a mini 4-inch “test cake.” The Boyfriend, who is NOT a fan of sweets, kept “leveling it off” … just another little slice, just to even things up. I’ll be serving the real cake this afternoon, sliced and filled with raspberry jam. Perfection. You’ve gone and done it again! This recipe makes the most perfect summer dessert especially when accompanied by your baked vanilla nectarines and cherries. Oh, and yes also with a scoop of noyeau ice cream. Can’t tell you how many times I have made it. It is simple perfection. For a bit of a change I also make Tamasin Day-Lewis’ Macaroon cake. The macaroon topping gives it a bit of a crunch. 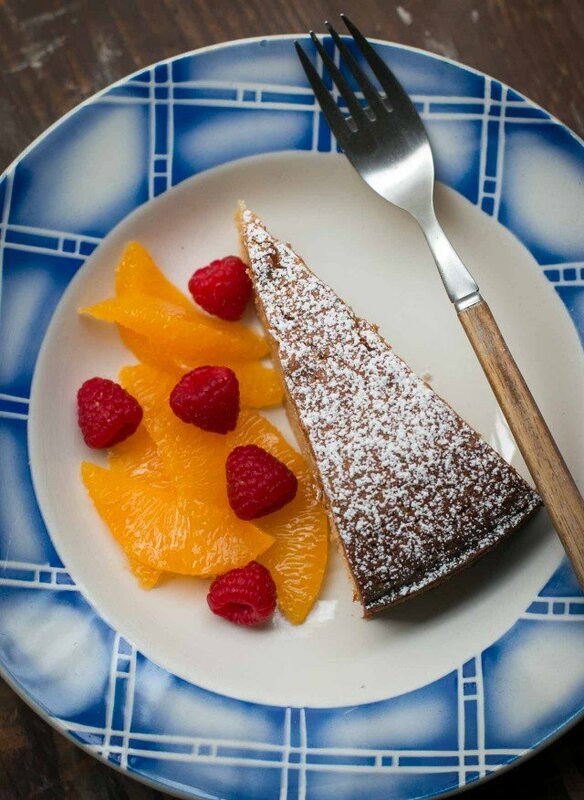 Have you ever tried the almond cake recipe from Alice Medrich’s book Pure Dessert? I have made it quite a few times & love it. I’ve renamed it The World’s Easiest Cake. She grinds almonds & sugar in the food processor instead of using almond paste. This might be a good alternative for your readers who can’t find almond paste. Have you tried Supermercados Pueblo or Supermercados Amigo (owned by Walmart)? Cake is in the oven but I have two questions. First, all the almond paste I can find is in 7 oz tubes and since it is so pricey (egaads $8 in California … almond capital!) I only used 7 oz. Should I have bumped up another ingredient to make up for the missing oz? Second, if I greased & floured then why does the bottom need parchment paper? Seems like double work for the same result. Taking the cake with peaches & whipped cream to Mah Jongg tomorrow. Seems perfect with tea & tiles. tracy: Since the batter is somewhat sticky, I recommend both greasing the bottom and using parchment as extra insurance the cake will come out. Both are fairly easy steps but one could likely do one or the other. But it’d be a shame to have trouble unmolding the cake. I’ve not made the cake with 7 ounces of paste so can’t advise; but let me know how it turns out. Ren: I haven’t, but that’s a lovely book and her recipes are terrific. Thanks for sharing this delicious recipe ! It really sounds yummy. crust and the custard..) which came out great too. David: I do love this cake, since I love almonds more than any other nut (other than the ones I’m related to). A lot of almond paste recipes recommend grating the paste on a box grater, which gets it pretty well broken up prior to mixing. The Odense website is very helpful and the apple in a bag thing will help for semi-dried out almond paste. I usually stock up at Passover because I make tons of almond macaroons using almond paste. Right now the East coast is way too hot for even the thought of turning on the oven. Fortunately I leave for France on Wednesday, but no time in Paris…instead a fabulous wedding near St. Tropez and then on to the Dordogne for a real estate search. Maybe next year you can join us for my almond macaroons. We love to have a big crowd at seder and we rock it! Cake is gorgeous! I can’t wait to bury it in peaches and whipped cream this afternoon. After taking the cake out of the pan, I see why both greasing/flouring and parchment paper is needed. Bottom came out clean as a whistle but the sides stuck a little, and I think I didn’t grease/flour enough. I’ll just put sliced peaches around the sides and no one will know about the defects. The upside to the sides sticking a bit is I got to test the cake without cutting into it. Boy, is it delish. So far, it doesn’t look like using 7oz of almond paste made any difference. I’ll let you know if I notice anything when I slice it. For those of you looking for the Love n’ Bake almond paste, you can order it from King Arthur Flour. Their website http://www.kingarthurflour.com carries all the best baking ingredients, and I’m willing to bet that they ship internationally since customer service is what they are all about. They are an employee-owned company! I order all my stuff from them. Grumble, grumble: in a 9″ cake pan, the batter overran and spilled in my oven. Well, now the dinner party will have almond trifle rather than cake! Just made the almond cake for 4th July weekend – it’s fantastic! Also having a Belgian son-in-law we’ve been a big fan of Lotus Speculoos Cookies. After bringing home a suitcase full I found out that Walgreens is a distributor! We ordered the Biscoff Spread after you wrote about it – and reordered 3 times! We’ve been giving jars to everyone as gifts. I also found out after talking to the San Francisco office that the NY food truck that sells waffles has been buying cases of the spread! Thanks for a wonderful, informative blog! David — I have made this cake using your original recipe with 10 oz of butter and I would not change a thing. Too buttery? What is that? It’s perfect the way it is! This and your fresh ginger cake, are my go-to desserts. You are a sweet genius! Made it yesterday & it came out yummy. I used a 7 oz tube of Odessa almond paste instead of 8 o.z. & it was fine. i made both a high loaf in a loafpan & a flatter cake in a low pan (the latter baked for 35 mins). the recipe produced so much cake that i could have halved the recipe. regardless, it was lovely, easy & delicious. thanks! Ate Tracy’s stab at this cake with peaches & whipped cream at mahjong yesterday….zomg! I wish I hadn’t had a main course so I could’ve had a bigger piece. And I am NOT a sweets person. Yum yum yum!!!! I made this yesterday using a 7 oz tube of Odessa paste and it turned out fine. I will use a springform pan next time, though, because it overflowed in a 10″ cake pan. I saw it happening and slid a cookie sheet onto the lower rack, giving us delicious crispy bits to pick on while we waited for the cake to cool! Made this cake last night and tasted it about an hour after it was unmolded – DELICIOUS. I have some strawberries, raspberries and blackberries that I made into a sauce and just now brewed the coffee! It’s a sunny morning in NorCal and I can’t wait to share it with the family this AM! This is a fantastically easy recipe, thank you! I think almond is an underused flavor in the U.S., and regularly crave the croissants aux amandes I used to eat on Sunday mornings in Paris. This cake sounds delicious! I’m gonna try it with noisettes (hazelnuts) instead. when I was in france I had these noisettes muffins by Bonne Maman that look like they’d have the same moistness and texture. Looks great. I love almonds reminds me of childhood and Italian pastries. I can’t wait to try this; my mouth started watering as soon as I saw the picture. If this turns out anywhere near as well as the Spiced Apple Cake people will be lining up at my door! Also, I’ll have to try making it gluten-free after the initial recipe. It sounds like it could work for some members of my family. I made your almond cake on sunday and served it yesterday with strawberries from the marché… So good ! One of my guest went home with the rest of the cake.. quel succès ! I made this fabulous cake for the first time on Sunday. For what it’s worth, it baked in 40 minutes rather than 65 (and it probably could have come out a minute or two sooner). I have a thermometer in my oven so I know it is not running hot… Just thought I would share the observation. Love the Sweet Life in Paris and the blog. Such a treat! Hi Lori: Glad you liked the cake, and the book! Interesting that cake took much less time in your oven; the recipe in Lindsey’s book gives the baking time at 1 to 1 1/4 hours. But as you know, it’s good to be vigilant when things are baking. Jean: Odd that yours overflowed because as you can see in the picture, mine was just right. Good thing you had a pan underneath, but I’ve made this cake a zillion times and haven’t had that happen to me. & Karen: Thanks for the heads-up on the 7ounce tubes of almond paste working out fine! I was out of almonds, so I used cashew nuts instead (and made my own paste, using the link you suggested), and it was fantastic! Only, there’s no such thing as cashew nut essence — as far as I know — and so the flavour wasn’t as strong as I’d like, but it was a beautiful cake. Can’t wait to try it with almonds. What can I say, My Grandad was an ALMOND rancher in California. I grew up having slumber parties with my friend Guida in the orchard. Falling asleep to the fragrance of Almond blossoms was a dream. Considering I lived in an Orange Grove at home, I had it all as a kid! Will try the cake tomorrow as a friend returning to a 110 electricty place (poor thing) gave me a small portable oven. The Spanish HOME ovens are rather famous for failure. How I miss my BIG CONVEC oven from The Bakery. Hey, I live walking 5 minutes from the BAY OF CADIZ. Happy hot summer in Paris, It is 19:22 and I’m off for a swim! This looks like a literal slice of heaven! I think I’ll try it with some fresh blueberries. mmmm glad I found this recipe just in time for summer. i’m always looking for new vehicles for some marscapone whipped cream! I LOVE Almond so I can’t wait to try out this recipe. Thanx David! Oh how I love my little neighborhood grocery store – not one but TWO kinds of almond pastes!I’m going to make this dessert for my wine group next week. I just finished making limoncello (my first attempt – better than mediocre, but not stellar) and I think I’ll pour it over the cake, perhaps with some fresh fruit and powdered sugar. I’m excited to have an excuse to use my food processor, too, since I got it a few months ago and haven’t used it much yet. I just put this cake in the oven and if the taste of the raw dough is anything to go by, it will be exquisite! I made the almond paste from Joy of Cooking. I can’t wait to serve it. 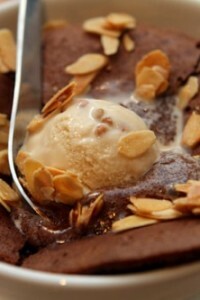 Hello, I found this supplier for 50% almond paste in France: http://jeanherve.fr/ The prices look reasonable. this is a keeper . I told everyone where I found the recipe. I am sure you will have many more fans. Six of us went to a cabin in the north Georgia mountains for the 4th of July and I made your wonderful almond cake. It was absolutely delicious with South Carolina peaches and a dusting of powdered sugar! I like that it isn’t too sweet and that the texture is fine like a pound cake. This is going to be one of my go-to recipes. I could also only find almond paste in a 7-oz log, so added a couple of extra tablespoons of flour to compensate and a drop more of the almond extract. It may have produced a little different product, but it was spectacular. At one point I was afraid that the batter was going to overflow my standard 9-in pan, but it didn’t and I ended up with a tall beautiful cake Next time I may use a springform pan. I love your blog and wish I had known about it before I went to Paris! Thank you for this recipe. our friends and I enjoyed this with some fresh plums tossed in plum reduction and some almond praline candies. It was simple and perfect for the wknd. 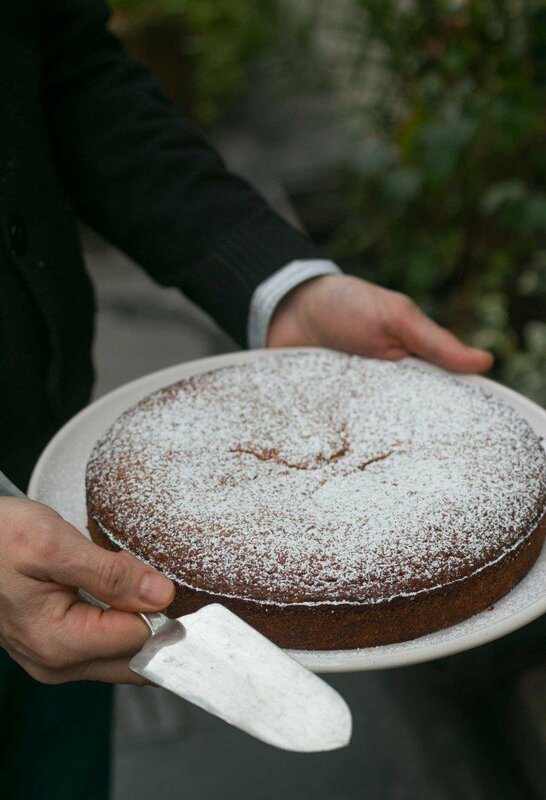 This almond cake recipe was also in Alice Waters’ The Art of Simple Food. When I first saw the recipe, I wondered if I could reduce the butter from 2.5 sticks to just 2; thank you for answering that question. There’s a chocolate cake recipe in the Art of Simple Food, and I was wondering if that’s also a cake that you made a Chez Panisse. I didn’t see it in Chez Panisse Desserts, but I thought that I would ask anyway. If you have experience with this recipe, do you think that the sugar could be reduced? And what type of frosting (if any) do you think would be good for this cake? Thanks. Well, I made the cake and WOW. So good. It was quite easy, too, though I wish I’d pulled it out 2 minutes sooner as the edges were a teeny bit on the dark/dry side. I have a very dark pan, too, and am under the impression that might have something to do with it. I served it with limoncello, creme fraiche, and blueberries, and frankly the sides were a bit too much. Next time it’ll be just some powdered sugar and nicely sliced fruit, I think – much like your photo above! I made this cake for a World Cup Finale party and it was a huge hit! Folks were not expecting the almond flavor — I guess standard yellow cake is the norm. Thanks very much for sharing the recipe. Hi David — I’ve made this cake about a zillion times — it’s a favorite among my friends & family (and it’s become the reason I keep those huge several-pound-cans of almond paste laying around). I grate the zest of one good sized orange into the batter, just to make it a little bit of my own thing. It’s deelish, and people always comment on the flavor of orange. PS — loved your post of the vegan strawberry ice cream — something else to include in the selection of desserts for my vegan friends …. cheers! Hi Julie (and others): I was surprised to hear that your cake batter rose above the top of the pan, because as you can see in the photos, mine rose nicely to the top..and stayed there. But I added additional information to the end of the recipe about cake pan sizes. Just wanted to thank you for sharing this recipe. When I saw you post this I knew I had to make it cause it sounded so good. Made it for a potluck today and served with fresh peaches and of course there was none left at the end of the pot luck. Love the simplicity of the cake yet it has so much flavor. Also, baked it in a 9 x 2 pan and 30 minutes into it it was really rising up high and I was thinking it was going to over flow but I trust your recipe and kept it in and it turned out perfect! Thank you David! Interesting about the rising problems! I made the cake in a springform pan (is that what you call the pans with the removeable bottom?). Mine leaked out the bottom a tiny bit, so I stuck some foil underneath it, but otherwise had no problems. It did rise a fair amount but the pan tolerated that easily. Thanks so much for adding your note on the cake pan size, David! It really would’ve been all right if the batter, before baking, hadn’t filled the pan to the top–that extra half inch a standard pan would’ve granted would’ve taken the batter that overflowed from my pan. I cut the muffin top and lava fall away from the cake and munched on the leftover bits, then piled the cake itself with fresh berries. It’s the best almond cake recipe I’ve ever had, and my friends and family loved it! 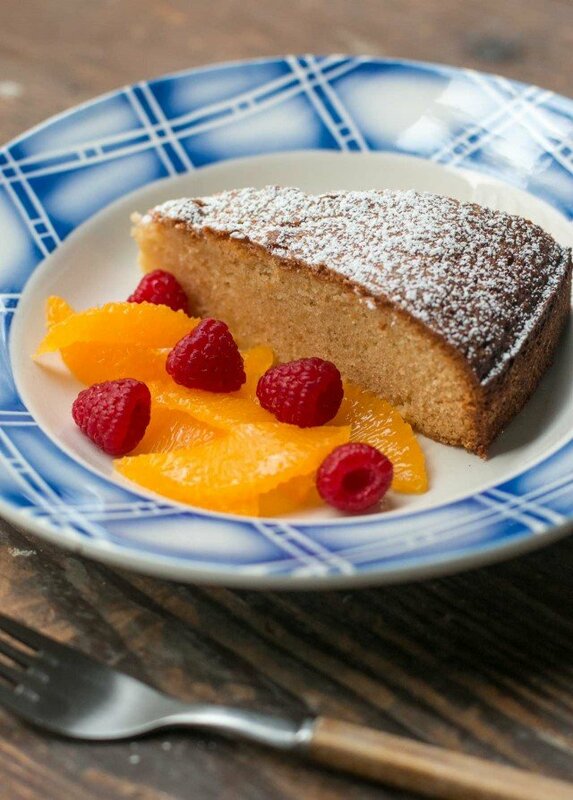 Have you tried Amanda Hesser’s almond cake? If you haven’t seen the recipe, it’s easy to Google up. I want to try that recipe, too. Fantastic cake. I made it a few days ago. Nicely photogenic too! I promised my mother an almond cake, and was going to make one with lemon zest and limoncello, but my niece despises anything that resembles citrus, so this cake sounds wonderful! I think i’ll make it with your candied cherries to serve on the side, along with some fresh whipped cream. Yummmm, and thank you, David! OMG. I have a dozen different recipes for almond cake and have baked — and loved — every one of them. But this one…this moist, perfectly balanced, endlessly delicious cake has made me toss all the others away. I make it every week, topping it with sliced peaches or sliced mangoes or….just eat it out of the pan. David, you are a freaking genius! Although I refuse to use food processors, so I’ll grind down the almond paste etc. in my mortar and then squish in the butter with my fingers. And I’ll definitely be adding orange blossom water rather than vanilla. I just tried the recipe, the cake looks good, though the batter definitely expanded beyond the pan. I kindda had a mini dough explosion in the oven (and I’d used a 9″ pan, with 2″ high sides). I wonder if it’s due to the difference between the baking powder and what the French call “levure”. I’ve never understood that difference, may be baking powder is more potent? Hi Olivier: Hmmm, I use American baking powder (Rumford) when I test recipes, as well as in my home baking. I just made your almond cake recipe and it was delicious, I mean is delicious. Surely I haven’t snarfed down the whole thing already! The crust on top of the cake is out of this world gorgeous. I just love the almond fragrance and flavor. It’s a very heavy cake and I just realized, it’s quite expensive too! If I were to buy it from a store I wonder how much they would sell it for. I baked it in my mom’s kitchen and imagine my delight when I found she had a bit of amaretto in her pantry! I brushed the top of the cake with it and it was just heavenly. Thank you so much! I am actuallu baking this tomorrow, so if by any chance you have a chance to respond before then, that would be great! PS. The zucchini cake was INCREDIBLE. Kathy: i don’t know about using 7oz of almond paste but would image it would work fine. If you do make it with that quantity, let us know how it works out. I like salt quite a bit, especially with the strong taste of nuts to counterbalance it. So that’s why I dialed up the quantity. Happy baking! Thanks David. I made the cake with 7 oz of almond paste and I think it works just fine (actually I noticed the previous version called for 6 oz.). Unfortunately I baked it just a few minutes too long so it was not quite as moist as usual, but I don’t think that had anything to do with the quantity of almond paste. I didn’t check it until 1 hr, and probably should have removed at 55″. The cake was consumed by two French friends, with whom I sent home the leftovers so they could have it for breakfast. I don’t know if it’s a French thing, but these guys love cake for breakfast! Making almond paste is easy!!! David is right when he talks about using a food processor. Poor consistency and the risk of generating oil form all that friction. Standing mixer meat grinding attachment. Use the blade and the plate with the smallest holes. Operate the machine at it’s slowest speed. Feed the almonds into the feed tube slowly. They arrive for your use in a perfect powdery condition. Rejoice! You don’t have to spend $15.00 for some lousy tasting tube at the supermarket. Don’t forget to blanch and peel!!!! Just wanted to say thank you for the recipe! I’m gluten intolerant, and was able to substitute the cup of flour easily for gluten-free flour. Turned out super moist – one of the best gluten-free cakes I’ve ever had! Thanks again. It’s extremely easy do do almond paste. Get some almonds, boil them so you can remove the skins, then toast them a few minutes to enhance the taste, and then grind them in a food processor or in a nut grinder (Cuisinart has a good one). Or just buy the almond meal (hint: Trader Joe’s). Then mix 50% almond meal with 50% confectioner’s sugar, and add a few drops almond extract, and a LITTLE water, 1 tablespoon at a time. You want rather large lumps to form not a paste. When that’s done just knead it by hand and it will become a paste. Optionally you can add some color and shape it in a log. Maybe David can come up with an even more tasty recipe. I’ve made this cake about 10 times since July (parties, piggyness, etc.). Once I turned around after the cake was already in the oven to discover, I had forgotten to add all the butter. Sacre bleu! “What a waste”, I thought, of this beautiful (and expensive) 50% almond paste ($36/1000g). It was too late to add it – the sides were already rising. It was really good. It was really, really good. Still moist. A tad rubbery in texture. But the almond flavor shined. I later made the cake twice with 8 oz. of butter and though scrumptious, it tasted more of butter cake than of almond cake. I’m making it with less butter, today (a mere 4 oz.) for the birthday of one of the best peach farmers in California). I’m going to add Indian Blood peaches and the reduced peach syrup from the maceration process into the batter (reducing added sugar). I’m also going to top the cake with the requisite confectioners sugar plus the amazing salty sweet sliced almond brittle recipe you gave with your peach sorbet (also earth moving) recipe in the LAT some time ago. It’s addictive. Thanks for a great recipe and a great discussion. Made three cakes with only 4 oz. of butter. Great texture. This the right amount for me. It really allows the almond to come through. I really love this cake. I made it over the summer with spectacular results, and just took my second one out of the oven. I didn’t remember it rising above the pan last time, but it did this time. No sweat, it’s fine now. The top is a little browner than I remember it, but I’m going to dust it with powdered sugar when I serve it tomorrow and it will be great. The house smells divine! My husband just mixed up a batch of the salted butter chocolate chip cookies and we’re going to bake those soon too. It’s a great baking night in my house! Great site! I’ve had great success with your chocolate idiot cake and I’m already deciding which of your books to buy from Amazon. I can’t seem to find a reliable and affordable supplier of almond paste here in England. I’m guessing from the other comments and the tags that marzipan would be an acceptable substitute? Hi Alan: Marzipan often has extra sugar in it so although I haven’t used it, I’d be cautious about swapping it out. A few people noted methods for making almond paste in previous comments but almond paste in general, shouldn’t be that tough to find. I would imagine that Waitrose would have it. Or you might want to try somewhere online, and you can use one of the places mentioned in my post; How to Find Foods & Other Items Mentioned on the Site. Aussie readers , has anyone had any luck finding Almond Paste here? I ate a piece of this cake with my cup of coffee this morning and just LOVED it. I ran back for a second piece and tried it with whipped ream and then chocolate frosting (which I was skeptical about)… Both were equally divine. Thank you!!! Great recipe. I read your blog all the time, your recipes are clear and straightforward (I also did your apple jelly). Thanks for a great blog with wonderful advice.